Historia de Barcelona: 22 de November de 1936: Los funerales de Durruti; la organización agrícola e industrial. 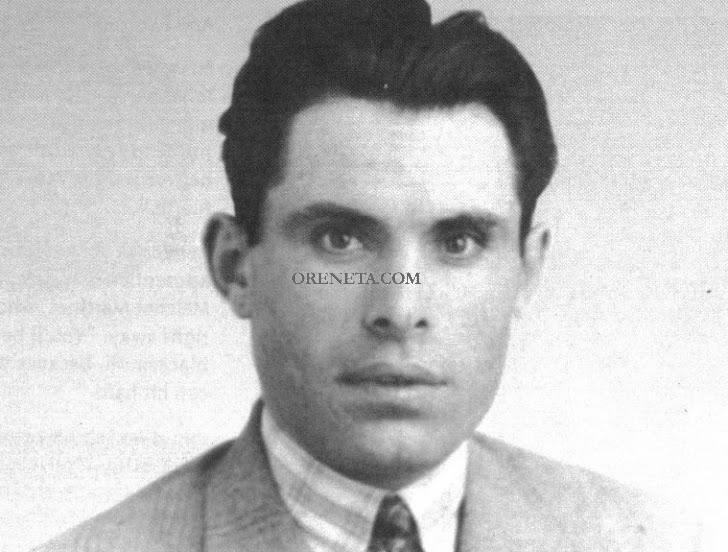 Buenaventura Durruti, sin fecha. Imagen: Wikipedia. Durruti’s funeral was this afternoon. The attendance at the parade and in the streets was massive. The whole city was out. The CNT ordered that all shops, bars, etc, should be closed during the ceremony. Most people organised by the CNT and the FAI were present at the gathering. Particularly interesting was the troop of control patrols (Checas) in their black uniforms. They turned out in their hundreds. I learned the truth about Durruti’s death from Nin, whom I met afterwards in a POUM bar. This is the way it was. On returning to the front Durruti ran into a group of milicianos coming away from the front. He asked them to go back. There was fight and he was shot by one of them. The public is unclear about the real story, and assumes that Durruti was killed by a Fascist bullet during an ambush. Durruti’s end is not inconceivable, according to reports of his general behaviour. POUM comrades told me how he was once most unfair and despotic in his dealings with a POUM column, and it was mooted at the time that certain people wanted to kill him. Durruti was very capable militarily, but he often seemed too undisciplined and despotic. On Sunday afternoon: Housewarming at a POUM Pioneer House. Like many others this house was confiscated by the POUM. It was originally a bourgeois country house. The pioneers — youth between the ages of 10 and 12 — made a very lively impression. After that a housewarming at a POUM library in a part of town called Gracia. The library is in a house which was taken over from a Marquis who had fled. The Committee of POUM Youth is there, as is comrade [Walter Schwarz]’s office (International Left). Most of the library’s collection comes from bourgeois houses in Barcelona, whose property was confiscated. It also contains Comrade [Ewald König] book collection. The inaugural speech was made in Catalan by a POUM member — a teacher. It stressed the class and Marxist orientation of the library and the class nature of all culture. Comrade König works in the library. In total, about 200 000 workers are supposed to have been called up into the army by now. It is estimated that in the rest of Spain the number is around 150 000. In any case, it is a smaller number than in Catalonia alone. These estimates are from comrades and are not official. Factories with more than 50 workers have been expropriated (incautado), while those with less than 50 have been put under workers’ control. Some of the smaller factories which produce munitions can be, and have been, taken over. Along with the confiscation of the factories goes the confiscation of factory capital. There is now a centralised distribution of raw materials, fuel, etc, in Catalonia, organised by the Economic Council. Foreign owners of factories have been promised compensation, but this is of only formal significance as no guarantees have been made as to how or when compensation will occur. In the evening I had a conversation on the state of Catalan agriculture with Comrade Sarda, who is supposed to be one of the POUM’s best agricultural experts. About 80 per cent of the land is suitable for modern mechanical farming methods. About 20 per cent of the land cannot be worked mechanically, due to its situation on mountain sides, hilltops, etc. Modern methods are also possible in the olive plantations, which are very important in Catalonia, and also in vineyards. Cultivating olives needs careful attention and plenty of fertiliser, otherwise they yield a small crop. Grain production is also very important here. Agricultural conditions vary a great deal in the different parts of Catalonia. In the area around Barcelona vegetables and fruit are intensively cultivated. The peasants in this area exported vast amounts, mainly to Britain, and were economically quite well off. Large estates predominated in Lérida province, which is now decisively under POUM influence. The other parts of Catalonia are mostly made up of small freeholders and tenant farmers. There are two types of tenant. First, there are the rabassaires. They provide all the equipment themselves and pay one third of the crop to the owners. The owners generally have nothing to do with the enterprise and, living on their rent collecting, tend to spend their time in cafés. The second category of tenant is just like the métayers in France. The owner provides all the equipment, including half the seed. The tenant then gives half the yield to the owner. The rabassaire tenants tend to be long-term, between 20 and 30 years, while the métayers are short-term and can expect to be left high and dry at any moment. The revolution immediately gave these tenants the right to all of the crop which they produced. The big farms were expropriated and are now largely collectively farmed, and the rural workers are helped by representatives of the workers’ organisations from the towns. Most of the tenant farmers and small peasants have formed unions, sometimes several in one place (CNT, UGT, rabassaires, Anarchists, etc). It is now decreed that every locality should only have one union which all peasants and rural workers should join. Such a union might be thought of as an agricultural cooperative. For the rural workers it is similar to a trade union. The union takes care of the communal sale of agricultural products, the communal buying of goods for the village cooperative shop, and the common use of agricultural equipment, oil-presses, wine making, etc. However, the cultivation of the land tends to take place individually. There have been some problems in Catalonia, due to the fact that, under the leadership of the lower organs of the CNT, collectivisation of the land has been carried out more radically than the farmers themselves wanted. The farmers do not agree with many of the orders which have been issued. The leading bodies of the CNT have made statements against these excesses by the lower levels of the leadership, but they do not seem to be wholly capable of eradicating them everywhere. According to the opinions of some experts, these excesses must be stopped if the revolution in Catalonia is to survive, and ways and means are being devised to deal with the situation. On the question of distribution of food, things look quite different from what I expected on the basis of a report I got recently from someone returning from Barcelona. In general there is no sign of a lack of food, either in the rear areas or at the front. The province of Catalonia grows masses of vegetables, fruit oil, grain, etc. The restaurants and the food shops have plenty of these goods. In general the workers’ standard of living has risen since 19 July. Wages are up by 13 per cent. They are paid in full even for short-time work. The milicianos at the front get 10 pesetas a day, and their families in the rear are also taken care of. There is a certain shortage of potatoes, but this is not very significant. More important is the shortage of fresh meat which has arisen, because the regions from which most of the meat comes to Catalonia have been occupied by the Fascists. There is a lot of fish. There is some shortage of charcoal, the normal cooking fuel of Catalonia. The houses themselves tend not to be heated, as the climate makes this unnecessary. Here and there milk is in short supply. I have been told that many people eat in the restaurants because they get meat supplies. The soldiers at the front get priority when it comes to the distribution of meat. According to those who have just come from there, nourishment at the front is said to be very good. The cost of food is much, much lower than in France. In the party club a good meal can be had for between two and 2.5 pesetas. Wine costs between 40 and 50 cents a litre. There are queues in front of butchers and the shops selling cooked beans and peas. In answer to the question as to why there were relatively few turncoats at the front, it was explained to me that this is prevented, above all, by the terror which the Fascists use against the relatives of those fighting at the front. In spite of this there are still many desertions from the Fascist lines. At the front itself oral propaganda is generally shouted between the trenches. The Fascists claim that it is they who will carry out Socialist policies. Fascist aeroplanes drop propaganda leaflets. I have been told of some cases of the Fascists dropping Le Populaire, apparently to prove to the milicianos that the French Popular Front Government has left them in the lurch. It is estimated that the Fascists have shot about 200 000 workers. Following 19 July all the churches in Barcelona were set on fire. It is usually only the interior which is burnt out. We were told that these acts of arson fitted in well with the mood of the people. Many priests are fighting stubbornly, arms in hand, on Franco’s side. According to the milicianos, the military strength of the Falangists in Catalonia is thought to be very considerable. They are quite often large farmers who have fled, village profiteers, etc, and caciques, who fight all the more bitterly, because their whole existence depends on the outcome of the war. Comrade König, who was in charge of the German bulletin, has now been relieved of this function. The move was prompted by the Trotskyists, and some material about the Moscow Trials was used. [The reference here is to the first of the Moscow Trials] Comrade Walter Schwarz is the POUM’s official coordinator of international links. In addition to that he has been elected organisational leader of the important district of Gracia. To be politically effective within the POUM it is essential to be able to speak Spanish and at least understand Catalan. Comrade Schwarz’s good position within the organisation has something to do with the fact that he has been an active member of the POUM for four years and was active at the front, and has thus won the confidence of many POUM members and other people there. The leaders of the Catalan troops are very quickly trained in people’s military schools. To enter one you must get recommended by a workers’ organisation. The entire course lasts four months. It is mostly concerned with training military leaders for the infantry. A smaller department trains those for the artillery. At the end of every four month period exams are held. Those who do a one month course are sent to the front as group leaders, after two months as non-commissioned officers, after three months as sergeants, and after four months as teniente or second lieutenants. The training is both theoretical and practical. It involves the elements of military tactics. The proletarian composition of these military schools is ensured by the way candidates are selected. But the number of bourgeois officers at their disposal is very small anyway, and is certainly not enough to form a bourgeois officer corps. The creation of proletarian military leaders is because of the situation after the revolt of 19 July in Catalonia. [ref3151], basada en la peli que hizo Enzensberger en 1971-2, contiene citas literales de los involucrados. La marcha fúnebre de Chopin cuesta más explicar, pero estamos en ello. El cadáver llegó a Barcelona tarde por la noche [es decir la madrugada del 22]. Había llovido todo el día, y los coches que escoltaban el féretro estaban llenos de barro. La bandera rojinegra que cubría el coche fúnebre estaba sucia. En la casa de los anarquistas, que antes de la revolución había sido la sede de la Cámara de Industria y Comercio,11 los preparativos ya habían comenzado el día anterior. El vestíbulo había sido transformado en capilla ardiente. Como por milagro, todo se había hecho a tiempo. La ornamentación era simple, sin pompa ni detalles artísticos. De las paredes colgaban paños rojos y negros, un baldaquín del mismo color, algunos candelabros, flores y coronas: eso era todo. Sobre las dos puertas laterales, por donde debía pasar la multitud en duelo, se habían colocado, a la usanza española, grandes letreros donde se leía: “Durruti os dice que entréis” y “Durruti os dice que salgáis”. Unos milicianos vigilaban el féretro, con los fusiles en posición de descanso. Después, los hombres que habían venido con el ataúd desde Madrid, lo condujeron a la casa. A nadie se le había ocurrido abrir los grandes batientes del portal, y los portadores del féretro tuvieron que estrecharse al pasar por una pequeña puerta lateral. Les había costado abrirse paso a través de la multitud que se agolpaba ante la casa. Desde las galerías del vestíbulo, que no habían sido decoradas, miraban unos curiosos. El ambiente era de expectativa, como en un teatro. La gente fumaba. Algunos se quitaban la gorra, a otros no se les ocurría hacerlo. Había mucho ruido. Algunos milicianos, que venían del frente, eran saludados por sus amigos. Los centinelas trataban de hacer retroceder a los presentes. También esto causaba ruido. El hombre encargado de la ceremonia daba indicaciones. Alguien tropezó y cayó sobre una corona. Uno de los que llevaban el ataúd encendió cuidadosamente su pipa, mientras la tapa del féretro era levantada. El rostro de Durruti yacía sobre seda blanca, bajo un vidrio. Tenía la cabeza envuelta en una bufanda blanca que le daba aspecto de árabe. Durruti era un amigo. Tenía muchos amigos. Se había convertido en el ídolo de todo un pueblo. Era muy querido, y de corazón. Todos los allí presentes en esa hora lamentaban su pérdida y le ofrendaban su afecto. Y sin embargo, aparte de su compañera, una francesa, sólo vi llorar a una persona: una vieja criada que había trabajado en esa casa cuando todavía iban y venían por allí los industriales, y que probablemente nunca lo había conocido personalmente. Los demás sentían su muerte como una pérdida atroz e irreparable, pero expresaban sus sentimientos con sencillez. Callarse, quitarse la gorra y apagar los cigarrillos era para ellos tan extraordinario como santiguarse o echar agua bendita. El entierro se llevó a cabo al día siguiente por la mañana. Desde el principio fue evidente que la bala que había matado a Durruti había alcanzado también al corazón de Barcelona. Se calcula que uno de cada cuatro habitantes de la ciudad había acompañado su féretro, sin contar las masas que flanqueaban las calles, miraban por las ventanas y ocupaban las azoteas e incluso los árboles de las Ramblas. Todos los partidos y organizaciones sindicales, sin distinción, habían convocado a sus miembros. Al lado de las banderas de los anarquistas flameaban sobre la multitud los colores de todos los grupos antifascistas de España. Era un espectáculo grandioso, imponente y extravagante; nadie había guiado, organizado ni ordenado a esas masas. Nada salía de acuerdo con lo planeado. Reinaba un caos inaudito. A las diez y media, el ataúd de Durruti, cubierto con una bandera rojinegra, salió de la casa de los anarquistas llevado en hombros por los milicianos de su columna. Las masas dieron el último saludo con el puño en alto. Entonaron el himno anarquista Hijos del pueblo. Se despertó una gran emoción. Por alguna razón, o por error, se había hecho venir a dos orquestas: una tocaba muy bajo, y la otra muy alto. No lograban tocar al mismo compás. Las motocicletas rugían, los coches tocaban la bocina, los oficiales de las milicias hacían señales con sus silbatos, y los portadores del féretro no podían avanzar. Era imposible organizar el paso de una comitiva en medio de ese tumulto. Ambas orquestas volvieron a ejecutar la misma canción una y otra vez. Ya habían renunciado a mantener el mismo ritmo. Se escuchaban los tonos, pero la melodía era irreconocible. Los puños seguían en alto. Por último cesó la música, descendieron los puños y se volvió a escuchar el estruendo de la muchedumbre en cuyo seno, sobre los hombros de sus compañeros, reposaba Durruti. Pasó por lo menos media hora antes de que se despejara la calle para que la comitiva pudiera iniciar su marcha. Transcurrieron varias horas hasta que llegó a la plaza Cataluña, situada sólo a unos centenares de metros de allí. Los jinetes del escuadrón se abrieron paso, cada uno por su lado. Los músicos, dispersados entre la multitud, trataron de volver a reunirse. Los coches que habían errado el camino dieron marcha atrás para encontrar una salida. Los automóviles cargados de coronas dieron un rodeo por calles laterales para incorporarse por cualquier parte al cortejo fúnebre. Todos gritaban a más no poder. No, no eran las exequias de un rey, era un sepelio organizado por el pueblo. Nadie daba órdenes, todo ocurría espontáneamente. Reinaba lo imprevisible. Era simplemente un funeral anarquista, y allí residía su majestad. Tenía aspectos extravagantes, pero en ningún momento perdía su grandeza extraña y lúgubre. Los discursos fúnebres se pronunciaron al pie de la columna de Colón, no muy lejos del sitio donde una vez había luchado y caído a su lado el mejor amigo de Durruti. García Oliver, el único superviviente de los compañeros, habló como amigo, como anarquista y como ministro de Justicia de la República española. Caía la noche. Comenzó a llover otra vez. Pronto la lluvia se hizo torrencial y el cementerio se convirtió en un pantano donde se ahogaban las coronas. En el último momento se decidió postergar el sepelio. Los portadores del féretro regresaron de la tumba y condujeron su carga a la capilla ardiente. Durruti fue enterrado al día siguiente. Buenaventura Durruti (2) José Buenaventura Durruti Dumange (León, 14 de julio de 1896 – Madrid, 20 de noviembre de 1936) fue un sindicalista y revolucionario anarquista español. Hanns-Erich Kaminski (1) Hanns-Erich Kaminski, nacido en Labiau (Prusia oriental), el 29 de noviembre de 1899, fallecido en Argentina en 1963, era un periodista y escritor alemán que también escribía en francés. Hans Magnus Enzensberger (1) Hans Magnus Enzensberger (Kaufbeuren, Alemania, 11 de noviembre de 1929) es un poeta y ensayista alemán considerado como uno de los representantes más importantes del pensamiento alemán de la posguerra. Juan García Oliver (1) Juan García Oliver (Reus, 20 de enero de 1901 - Guadalajara, 13 de julio de 1980) fue un anarquista español. Los de Barcelona (1) Los de Barcelona es un libro de H.E.Kaminski, seudónimo de Hanns-Erich Kaminski, un intelectual alemán de simpatías libertarias, que al igual que George Orwell, fue testigo directo de la revolución social ocurrida en España, en la Barcelona Libertaria en concreto.